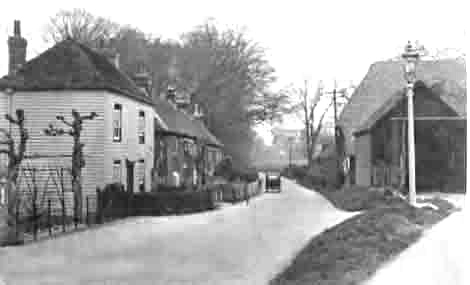 An early mention of a butcher in Nonington was made in a 1659 document when the White Horse alehouse in Church Street was sold by Henry Pingle, butcher, of Nonington, and his brothers. In the 19th and 20th centuries the principle butcher’s premises were in Easole Street and are now called Southdown House. The name almost certainly derives from one of the butchers, “Charlie” Smith, who specialised in fattening and butchering the Southdown breed of sheep. After the butcher’s closed in the early 1970’s the premises became an antiques and furniture restoration business and when this business closed the old shop, slaughter-house and cold store were converted into additional living accommodation. On the wall to the left of the entrance to the old butcher’s yard is a small stone tablet engraved with the name “I Ayers” and the date, 1832. John Ayers was first recorded as a butcher resident in Easole Street in the parish rates book around 1809, apparently at these premises. 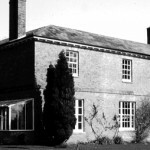 By 1828 his rates had more than trebled as he extended and improved the premises, in addition to which he also owned or rented various pieces of land. 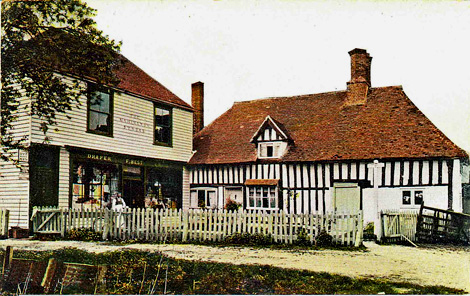 Butchers were also graziers who bought livestock for fattening for slaughter from local farmers and small holders either privately or at local markets such as Sandwich or, before its closure due to its rowdiness, the twice yearly Wingham Fair and cattle market. When my grandfather, Frank Webb, who butchered there from the early 1900’s until the mid-1950’s, was an apprentice he often had to drive livestock on foot from the weekly Thursday livestock market at Sandwich. Later, in the 1930’s my two uncles, Frank and John helped drive cattle back from Sandwich marshes in early autumn where they had been grazing and fattening during the spring and summer. My Uncle John worked as an apprentice for “Charlie” Smith, the butcher, for a time before joining the R.A.F. for war service, after which he moved to Gravesend. Various pieces of grazing land in and around the parish, as well as the pigsties in the nearby White House farm-yard, now houses, were rented by different butchers over the years. The bridle way to Eythorne, still called Butcher’s Alley, runs past a field known in the past as Butcher’s Meadow. John Ayers was succeeded in the 1850’s by Henry Ayers, his son, Henry, who was butcher until the late 1870’s when Frederick Pidduck from Eastry took over the business until it was sold to Edward Woodruffe took over in the 1890’s. My grand-father came down from Newington-next-Sittingbourne to work for “Teddy” Woodruff around 1908, initially “living in” until he married in 1914, and working for the business after it was sold to Charles Smith in about 1920 and also after J. R. Chapman bought the business just after the end of World War 2. Cyril Hearndon, who was the last butcher to occupy the premises took over in the late 1950’s and ran the butcher’s shop until the early 1970’s. The 1851 census records the premises of Robert Penfold, pork butcher, living in Church Street Row, the former Poor House Cottages, which then evolved into the grocer’s recorded in the 1861 census into a grocers and beer shop run by his son, also Robert, aged 24, with his daughter, Henrietta, aged 18, as house-keeper in 1871. Robert, junior, married in the early 1870’s, and closed the shop before moving to Battersea in south London where he is listed in 1881 census. The shop was only allowed to sell beer for consumption off the premises, at this time beer was commonly drunk at home as water sources were often not pure and some labourers were partly paid in beer or cider. George Kirby, master butcher’ was listed in 1871 as living in Easole Street and employing one man, Frederick Allen, at his premises. These may have been either in the area to the rear of the Baptist Chapel, where there were then six or seven cottages and gardens, or possibly in the end premises on the opposite side of the road to the Chapel which later became a shop. 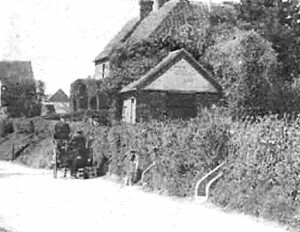 For many years the village bakery was situated to the rear of what are now the two cottage next to Home Farm. The earliest record of a baker in parish tax records is Jacob Chandler, who was also the corn miller until giving up the mill around 1819. John Chandler, Jacob’s son, is listed as the baker in the 1841 census but no bakery is listed in or after the 1881 census. The Church Street Poor House accounts show many payments to tailors and dress makers for clothing for the poor, and the various 19th century censuses record several dress makers and tailors in various parts of Nonington parish. The coming of the railways in 1861 and the subsequent ready availability of cheap mass-produced clothing gradually forced them out of business by the later part of the 1800’s. Most appear to have been small concerns working from home with one exception, the Holtums. Payments to John Holtum are recorded in the Poor House accounts of the 1820’s and 30’s, other Holtums were listed in the parish rates prior to this but no mention made of their profession. The 1841 census records John Holtum, then aged 50 and a tailor, as having a tailor’s shop in Easole Street situated next door to the bakery. Presumably this is the same John Holtum recorded in the Poor House accounts, and who would have lost the Poor House business when it closed in the mid-1830’s. John’s widow, Maria, was recorded as the proprietress of the business in 1851, which then employed her son, John, and three other men. In 1871 Maria, aged 86, was still listed as a tailor with John as the foreman. The 1881 census records John as a master tailor but by the end of the 1880’s he had disappeared from trade directories and census returns and no large village tailoring businesses are listed in subsequent censuses but individual women were listed as seamstresses, probably just doing alterations and repairs or specialised work. By the 1880’s the railways and mail order had given people in Nonington people easy access to cheap, mass-produced clothing through the post or by visiting towns such as Canterbury or Dover. The Easole Stores opposite the Baptist Chapel with the now demolished Shakespear Cottage on the right. George Kirby’s butchers premises may have preceded the small grocers and general stores opposite Nonington Baptist Chapel which was originally run from the early 1900’s by Mr. Hill and then by Mrs. Gilham and closed in the late 1960’s. The shop sold tinned and fresh food, tobacco and sweets, and small children, myself included, were fascinated by the bacon slicer which used to stand at the back of the shop. For many years there was a general store in park gate keepers lodge at the Holt Street entrance to Fredville Park. Initially the Woodruffe family, who lived in the lodge, sold produce grown in the Fredville mansion walled garden from their home. 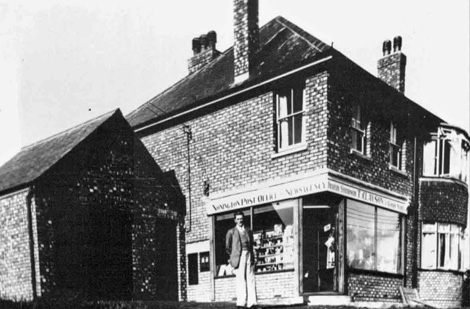 The business was very successful and eventually shop premises were added to the front of the house during the 1930’s. The Lodge Stores shop had various proprietors over the years, the longest serving was Mrs. Pilcher, and the shop finally closed in the early 1990’s. The shop front was removed and the lodge returned to its original state which can be seen in pictures on the Fredville Gate Lodges page. For a short time in the 1930’s the Murray family ran a grocery business from the Easole mill premises, taking orders and then delivering the items ordered to local people. One of the sons, Jimmy, along with Peter Broadbent from nearby Elvington, later went on to play football for Wolverhampton Wanderers in the 1950’s. The general stores and linen drapers. The medieval timbered farmhouse had for centuries been part of a small tenanted farm and eventually became part of the Goodnestone estate in the mid-1700’s. The 1851 census recorded Mrs. Sarah Holloway as the tenant farmer farming 24 acres and employing two labourers, and later in the decade she used part of the premises to open a linen drapers. The business must have been successful because by the time of the 1861 census Mrs. Holloway, then aged 61, was a draper and grocer employing two shop servants as well as being the farmer of 27 acres who employed one man and a boy with a house servant and a carter living on the premises. Sarah had retired by the time the 1871 census was taken, she had been succeeded by George and Eliza Holloway, her son and daughter-in-law, who then farmed 28 acres and employed one labourer and two general servants. By the time of the 1881 census George’s wife had died and he was described as “Grocer, Draper, Coal Merchant and Farmer of 28 Acres empl 2 men 1 boy” with Agnes H Stiff, a Dover born single woman aged 27, described as “Grocer & Drapers shopwoman” living in on the premises along with George Holloway, his 11 year old grandson, and Fanny Lawrence, a 15 hear old Whitfield born general servant. The Old Court Hill stores at the time of their sale in the 1970’s. The farm and shop changed hands in the late 1880’s, and in 1891 Robert Sisley was the farmer, grocer and draper there. By the time the 1901 was taken the farm had been separated from the shop and Sidney Palmer Clay was listed only as a grocer and draper. From the early 1900’s until the shop’s closure shopkeepers included: Kane and Lloyd, grocers and drapers; Fred Best; Vye’s of Canterbury and finally Mr. Hogwood, initially Vye’s manager until their decision to close the shop when he took over it’s running on his own behalf. His daughter, Peggy, lived there until just before the premises were sold in the 1970’s by the late Lord Fitzwalter to David Peacock. Great changes took place to the British postal service with the introduction of the Uniform Penny Post on 10th January, 1840, which charged a single pre-paid rate for delivery anywhere in Great Britain and Ireland and on 6th. May, 1840, the first adhesive postage stamp, the Penny Black , was introduced. Another postal innovation of the period was the introduction of William Mulready designed pre-paid postal stationery letter sheets and envelopes. 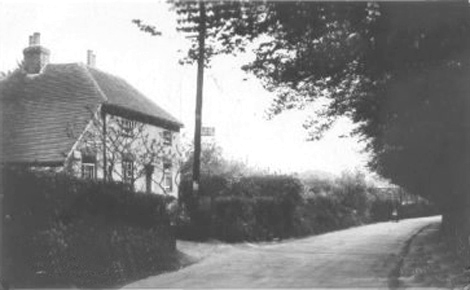 John Nash, the licensee of the Royal Oak, was the receiver of mail for the parish in 1845, and it is almost certain that the licensee of the Oak had taken over this duty when the White Horse in Church Street had closed in 1832, the White Horse’s licensee presumably having fulfilled the post of receiver of mail for many years previous. After his death John was succeeded as licensee and receiver of mail by his widow, Harriet. 1839: Uniform Fourpenny Post introduced. 1840: Uniform Penny Post introduced. 1840: First adhesive stamp (the Penny Black). 1852: First Post Office pillar box erected in Jersey. 1853: First post boxes erected in mainland Britain. 1870: Post Office begins telegraph service. 1870: Post Office Act banned sending of `indecent or obscene` literature; introduced the ½d rate for postcards; banned the use of cut-outs from postal stationery; introduced the ½d rate for newspapers; provided for the issue of newspaper wrappers. 1880: First use of bicycles to deliver mail. 1912: Post Office opens national telephone service. 1919: First international airmail service. In 1861 William Wanstall, a cordwainer and boot and shoe maker, was listed as the occupier and he lived and worked there until his retirement after which Clara and Louisa Holtum, his grand nieces, ran a grocer’s which was listed in the 1871 and 1881 censuses. By 1901 Thomas G. Batchelder, carpenter and post-master, previously the occupier of the Easole Street post office, had moved to the Drove premises where the Post Office occupied an extension built onto the side of the house which is still there. The Post Office was here until just prior to the Second World War when the Post Office and shop moved into premises purpose built by Mr. Tom Clayson, at the junction of Easole Street, Holt Street and Oak Hill, where it continued to serve the community under various proprietors until fairly recently when the Post Office was closed and the premises were sold and converted into a dwelling. At the Holt Street end of Easole Street is a small, black wooden building which for many years was the village chemist’s. Originally the chemist was run by Mrs. Fermor and then later her daughter, Mrs. Nora Dyson. 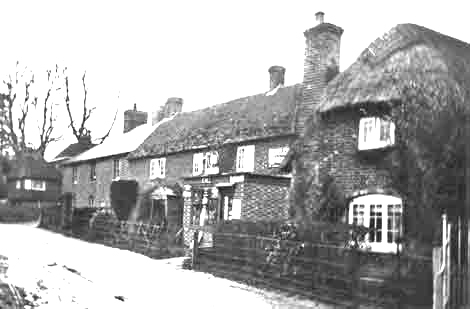 Villagers could leave prescriptions to be filled by Mrs. Fermor’s husband at his pharmacy at Eythorne, purchase remedies and toiletries as well as wool and also use the lending library for 3.d. or 6.d. per book. The chemists closed at the end of the 1960’s and was then for several years an antiques and bric-a-brac shop. The building is at present empty and suffered some fire damage a few years ago and is now sadly in a state of disrepair. 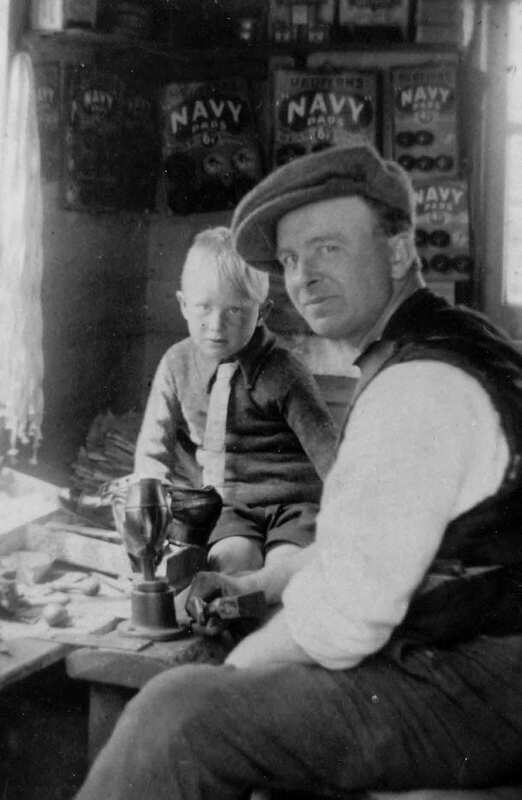 “Pop” Prebble with his son, Cyril, in the shoe repair workshop, which is still on the end of the house. He had lost a leg in the Great War and later trained as a shoe repairer. 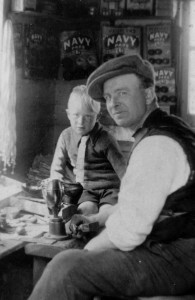 Mr Prebble and son in the shoe repair workshop, which is still on the end of the houseThe present Holt Street garage was once a cordwainer’s (leather worker) and boot makers premises and the cordwainer’s wife was a laundress who used the old brick building by the road as a laundry. The family lived in a thatched cottage at the bottom of the garage yard which fell down during renovation in the early 1960’s. 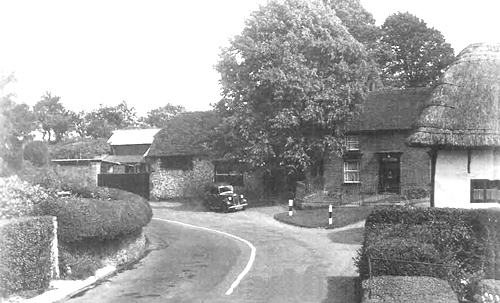 The premises became a garage in the 1930’s when William Sayers moved his business there from buildings at the rear of “The Royal Oak”. Opposite the garage was a boot and shoe repairers run by Mr. Prebble, who ran his business from a small workshop built onto the side of his house, now called “Repart”. Overlooking the road next door to “Repart” stands a small brick building with a large south-east facing shuttered window which was used until the 1920’s as a saddler’s, harness maker’s and boot maker’s shop, the large window allowed the saddler to work by natural light whenever possible. As horses were gradually replaced by motor-vehicles business declined and the shop closed in the 1930’s. Before the 1890’s the parish had several cordwainers and boot and shoe makers, who usually working at home but by 1910 only two were left as cheap, mass-produced shoes became widely available. In Frogham Street the Allen sisters ran a grocers shop from the 1840’s or earlier until at least the 1880’s in premises situated just down the road from Park Farm. The 1851 Ratling census recorded Mrs. Mary Green as a shop-keeper and Thomas Groombridge as a beer-shop keeper. 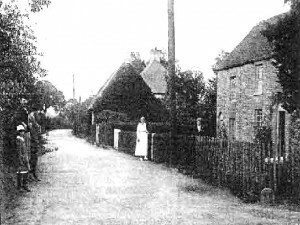 In 1861 Mrs. Mary Ann Green, shop-keeper, and Eliza, her daugher and a shop-worker, were living at Prospect Cottages, Ratling, but Thomas Groombridge’s beer-shop had gone. and by 1871 the Green’s were no longer listed as shop-keeper’s.